Five exhilarating days in our "World of Difference"
This guided tour has an exciting mix of cycling and off trail activities. As well as cycling the rail trail and enjoying the picturesque scenery in this amazing part of the country, we'll also explore the historic gold mining towns of St Bathan's and Macrae’s Flat. We can try our hand at the ancient sport of curling in Naseby, and visit Hayes Engineering Works. This tour finishes off with a trip on the Taieri Gorge Excursion Train for those wishing to end up in Dunedin. 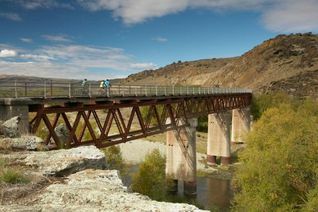 Cycle the Central Otago Rail Trail in style with our five day guided trip. 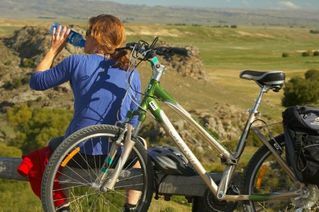 We provide bike rental, transport, accommodation and guides as well showing you through some great local pubs and cafes. We'll also show you the historic towns of St Bathans and Naseby, take you curling, and show you around a classic Manitoto station. Your adventure starts in Queenstown where you will travel to Clyde and be taken to the base at the start of the Rail Trail. There you will be fitted with your cycle and briefed by your tour guide. You will have the day to yourselves, so time to check out the shopping in Clyde and Alexandra, or visit the many attractions in the area. From Clyde you can cycle past vineyards and over an old wooden trestle bridge on the ride to Alexandra where you will stay for the night. 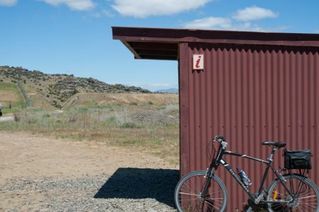 For the more adventurous, there is the option of riding on the Clutha River Centennial Track to Alexandra which adds another 8km to your cycle ride. From Alexandra you bike to Galloway Station where we boil the billy for morning tea with good old home baking.You then bike to Chatto Creek, twice crossing over bridges on the Manuherikia River. You will reach the Chatto Creek Tavern, an historic stone building which is where you will stop for lunch. After lunch you cycle up Tiger Hill, an easy gradient of 1 in 50. From the top of Tiger Hill it is all down hill to your over night accommodation in Omakau. Sites of significant interest are the Daniel O’Connor Suspension Bridge and the Ophir Post Office which will be worth checking out in this old gold mining town. You will then travel a short distance by bus to the historic gold mining town of St Bathan’s and a visit to the old Vulcan Hotel returning to Omakau. Highlight of today's cycle ride is the beautiful Poolburn gorge section of the trail featuring two tunnels and two viaducts all set in a secluded gorge. You then cycle through the vast open expanse of the Ida Valley farm lands past the Idaburn dam, one of New Zealands few outdoor winter curling sites. A site visit to Hayes historic engineering works, then there is a short ride to Oturehua for lunch at Oturehua Hotel. After lunch you'll cycle on to the Golden Progress mine just north of Oturehua, then on to Wedderburn just past the highest point on the rail trail before stopping the night. When you arrive at Wedderburn your guide will take you on a short side trip to Naseby to try your hand at curling and look through the old gold mining town. The evening meal is a traditional farm style meal. From Wedderburn the trail is mostly down hill to Ranfurly, the Art Deco Capital of Otago for morning tea by the old railway station, then crossing the Maniototo Plains on to the Waipiata Tavern for lunch. After lunch the day's highlight must be the lovely trail section between Daisybank and Hyde alongside the Taieri river which snakes around the Rock and Pillar Range. You then cross the stone Cap Burn bridge, the Price’s Creek Viaduct which is 32m high and the last tunnel which 152m long arriving at the recently restored Otago Central Hyde Hotel. This is your over night stop. Depending on the time you arrive at Hyde, your guide may take you on a short side trip up to the goldmining town of Macraes, the site of New Zealand’s largest working gold mine. Just a short ride today and slightly downhill with views of the Rock and Pillar, Taieri Ranges, and the Hyde Railway Disaster Memorial. For those traveling on the Taieri Gorge Train trip to Dunedin we will arrive at the Middlemarch Railway Station in time for you to depart. The rest of the group will then return to Clyde. Meals: Enjoy wholesome food with wine and beer available for purchase.